This post is part of my Cooking 101 Series. For more cupcake tutorials, be sure to also check out Cupcakes 102: Frosting, Cupcakes 103: Decorating, and Cupcakes 104: Storing and Freezing Cupcakes! Ok – I’ve been working on this cupcake series for a LONG. LONG. LONG. time. And I’ve been eating my weight in cupcakes in order to get all of the recipes tested and all of the photos taken. I know, I know, WHAT a sacrifice. It’s all for you guys. You’re totally welcome. Let me start by saying that I was really lucky. My grandma (a wedding cake baker) started teaching me to decorate cakes from the time I was a kiddo, and when I wasn’t learning from her I was in the kitchen with my mom (a caterer) so I was pretty much covered on the learn-to-cook front. I don’t remember ever seeing a can of cream-of-whatever in our house, and homemade pizzas and pastas were totally normal. So were homemade cupcakes (YUM). It wasn’t until college that I really started to see how different my culinary education was from the norm. I cooked all the time, (even before we had a kitchen – my roomie and I got a contraband hot plate and hung a few pots and spoons from ribbons on our dorm wall. It was very chic) and I started noticing how frequently I would get a “Wait…you MADE this? !” reaction from friends. I still make cupcakes for every special occasion (and a lot of non-special occasions that are just better with cupcakes) and I still get a “you MADE this? !” from at least one person. Every time. Without fail. To make great cupcakes, you need to first master the basics. After all, a beautifully decorated cupcake doesn’t mean anything if the cake itself is gross. You have to start with a tasty cupcake canvas! 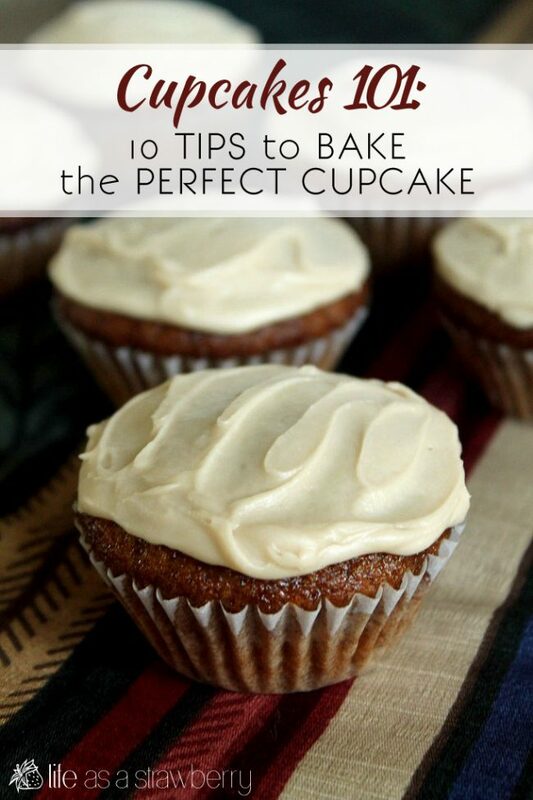 So let’s start with my 10 best tips for baking the perfect cupcake! 1. USE THE BEST INGREDIENTS AVAILABLE. Think you won’t be able to tell the difference between imitation and real vanilla extract, or that Dutch Processed Cocoa won’t make a difference? WRONG! Using quality ingredients makes a HUGE difference. If you taste test a cupcake with fake/cheap/flavorless ingredients next to a cupcake with high-quality stuff, the difference will astound you. Go ahead – I dare you! My favorite flavor enhancers are some Pure Vanilla Extract and this fair trade cocoa powder – they’re both so rich and have an amazing depth of flavor. Using quality vanilla (and cocoa, if you’re making a chocolate concoction) will make the most noticeable difference in cakes, so prioritize those ingredients over others if you’re low on funds or baking supplies. If your recipe calls for white vinegar, substitute apple cider vinegar for a bit more depth. I also prefer to make my own buttermilk instead of using store-bought. 2. BRING INGREDIENTS TO ROOM TEMPERATURE. Ok, confession: I don’t always do this. But I really should. 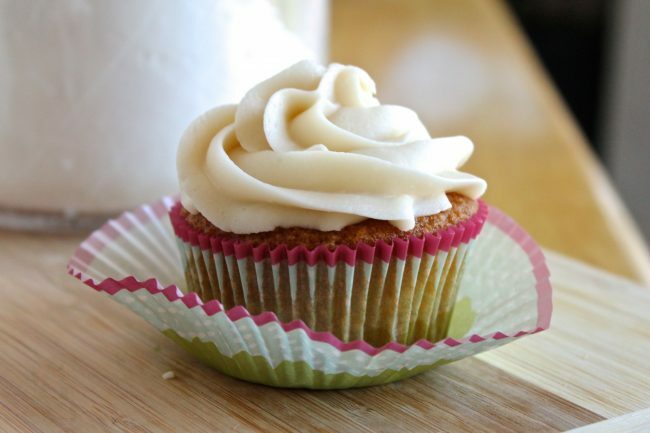 When you use eggs or milk (or beer/wine/liquor, if you’re making boozy cupcakes!) straight out of the fridge, they don’t combine as smoothly with the dry and room temperature ingredients. This can result in clumps of one ingredient sticking together and making an appearance in one unfortunate bite, which is no fun. Poorly combined ingredients can also cause a cake to be dense rather than light and fluffy. Rose Beranbaum (the guru behind The Cake Bible) suggests bringing butter to a temperature of 70 degrees Fahrenheit while warming eggs and other liquids to 60 degrees Fahrenheit. The butter’s temperature is especially important: the colder your butter is, the more time it will take to break it down into a cream consistency, which means you run the risk of overmixing your batter. Use nice, soft butter for the best results. The finished batter should ideally be between 70 and 75 degrees Fahrenheit, according to Beranbaum. You don’t have to bust out the thermometer every time you make a cake, but give your ingredients a touch and gauge their approximate temperatures. 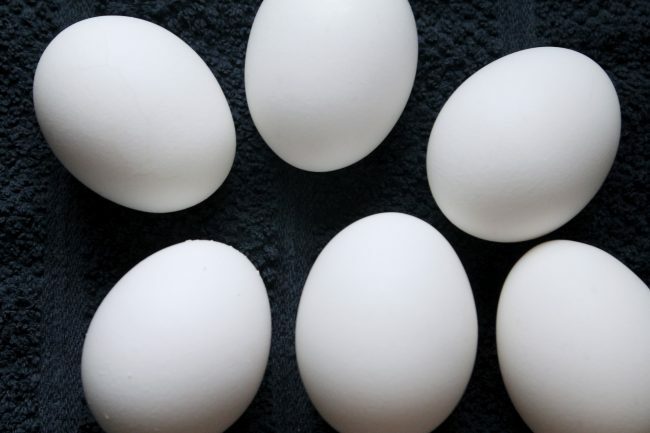 If your eggs and butter are still cold to the touch, let them sit awhile longer before you begin baking. 3. DON’T OVERMIX THE BATTER. You know how people say “baking is a science?” Yeah. It’s for real. The reason mixing times are so important is because the length of mixing determines how much of the gluten in the flour is developed (particularly with all-purpose flour, as opposed to cake flour which has less gluten to begin with). We crush some of the air bubbles when we overmix, and any remaining air bubbles have to work harder to expand as the cake cooks due to too much gluten development. That means that a ton of pressure builds up inside each air bubble, and when they burst they burst with a lot of force rather than a gentle expansion. The result is long, hollow tunnels inside of your cake, and a cracked surface that forms when air erupts through it like a volcano. The resulting cake will be denser, with a tighter grain. When we undermix, there isn’t enough gluten, which prevents the cake from setting correctly or forming a rigid structure and results in a flaky, crumbly cake with a fallen center. To ensure proper mixing, beat cake batter on low until ingredients have just combined. Don’t leave the stand mixer on and walk away! Watch carefully to ensure you aren’t beating the mixture any more than you have to. PS – for more info. on the science of baking, check out How Baking Works: Exploring the Fundamentals of Baking Science. It’s the bestttttttt. 4. 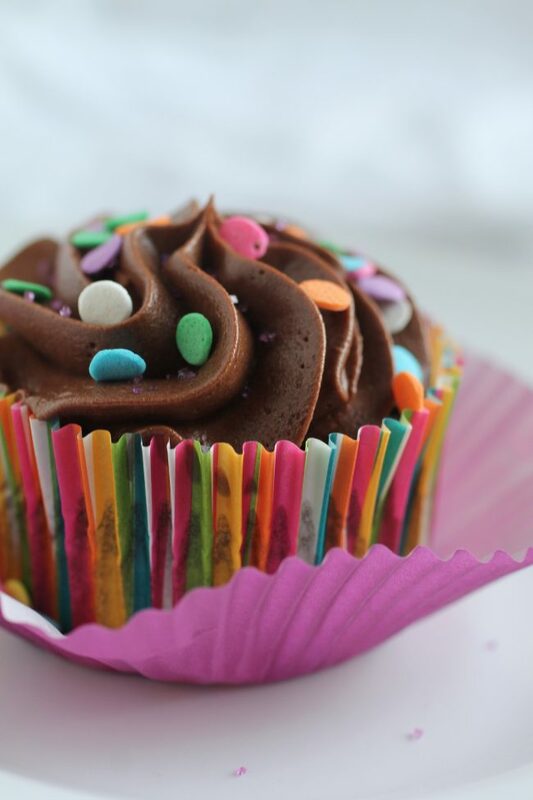 USE A SCOOP TO FILL CUPCAKE LINERS – DON’T EYEBALL IT. There’s nothing worse than pulling a tray of cupcakes out of the oven and discovering they all lie in one of two categories: overcooked or practically raw inside. The easiest way to ensure a uniform baking time is to make sure you’re putting the exact same amount of batter in each cupcake liner. This is more important with cupcakes than cakes because they’re so much smaller – a few tablespoons’ difference between two 8″ cake pans won’t make a huge difference, but if two cupcakes are off by the same amount they can come out radically different. The best way to ensure even batter distribution is to use a large scoop for standard-sized cupcakes and a small cookie scoop for minis. Fill the liners about 2/3 of the way for best results. 5. PRE-HEAT, AND THEN TAKE THE TEMPERATURE. It goes without saying that you should pre-heat your oven, but I’ll say it anyway: pre-heat your oven! If you put cupcakes in before the oven is ready, it will mess up their baking process. Also, ovens can be finicky. Invest in a good oven thermometer, and then use it! Double-check the temperature of your oven before you put your cupcakes in. Old ovens are especially rotten when it comes to sticking to a certain temperature, so be sure the internal temperature matches the number on your oven dial. I once had an oven so old that all the temperature numbers had rubbed off of the dial – baking was basically a terrible guessing game. An oven thermometer can take the guesswork out of mysteriously over- or undercooked cupcakes and ensure control over the baking process. 6. BAKE IN THE CENTER OF YOUR OVEN. When you’re ready to bake, set cupcake pans on the center of a rack set in the very middle of your oven. This will ensure good airflow and help even out heat distribution, preventing overcooking on any one side of the cupcake. If your oven cooks unevenly from front to back, rotate the cupcakes 2/3 of the way through cooking time. Don’t rotate any sooner, or the cupcakes may not have had time to set properly. If you’re baking several pans of cupcakes at a time, place each pan side by side on the same rack. If your oven isn’t wide enough for two cupcake pans at once, place two oven racks in the centermost positions of the ovens and stagger the cupcake pans so that they aren’t directly on top of each other. 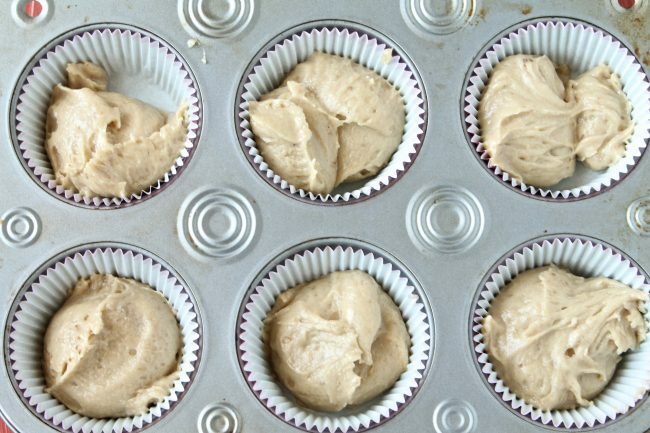 If one cupcake pan is directly on top of another, it will impede the oven air’s ability to circulate and can result in over- or undercooked cupcakes. Give each pan as much space as you can while still keeping each one as close to the center of the oven as possible. 7. RESIST THE URGE TO PEEK. I know that cupcakes are exciting, but don’t open the oven door over and over to check on their progress! If you slam the door open or closed towards the start of cooking, it can cause fragile air bubbles in the batter to burst and you’ll end up with a dense cake. Even if you’re gentle with the oven door, a rush of cold air can disrupt the structure of the cupcakes as they begin to bake. The gluten and fat molecules in the batter are what helps the cupcake set and maintain its fluffy, light structure – give those molecules awhile (at least 2/3 of the total baking time) to set and stiffen up before you introduce any cold air to the atmosphere by sticking your nose in to check on things. If you’re too quick to poke around, you may find yourself with dense, sunken cupcakes. 8. DON’T LEAVE THE CUPCAKES IN THEIR PANS. Let cupcakes cool for no more than a few minutes in their baking pans before you remove them to a wire rack (I love this three-tiered one from Wilton!) The heat from the pan can cause the cupcakes to overcook, which will dry them out. Use a potholder and gently shake cupcakes out of the pan, then place them on the rack and leave them there until they’ve cooled completely. Don’t try to frost the cupcakes too soon! Even a tiny bit of warmth coming off a cupcake can melt your frosting. When cupcakes have cooled completely, store them in an airtight container so they retain their moisture. You can use a large tupperware (this is my first choice if I’m storing frosted cupcakes – I use a tall bin so that the heaps of frosting won’t get squished!) or, if you’re waiting to frost them, wrap them tightly in plastic wrap. Cupcakes will retain their moisture at room temperature for a day or two, but after that it’s good to store them in the fridge or freeze them for later. Cupcakes freeze well – wrap unfrosted cupcakes individually in plastic wrap and store a few in a plastic bag, then pop it in the freezer. Defrost a bag whenever you feel like a cupcake, then frost and enjoy! 10. FROST THE WHOLE CUPCAKE TO RETAIN MOISTURE. Dry cupcakes are no fun, and cupcakes left out too long will definitely dry out. When you frost cupcakes, the frosting acts like a light seal to help the cupcakes retain moisture. Be sure to cover the entire exposed top of the cupcake with frosting as best you can, and your cupcakes will retain their moisture for longer. This is especially helpful if you’re baking cupcakes for a display or event, where they will be sitting out uncovered for a long period of time. 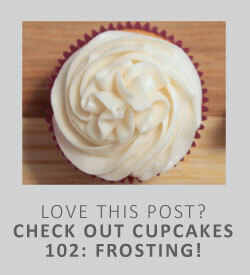 I hope these tips will help you the next time you whip up a batch of your own cupcakes – don’t forget to check out Cupcakes 102 (Frosting), Cupcakes 103 (Decorating), and Cupcakes 104 (Storing and Freezing Cupcakes)! OH, and PS – I made you an all-about-cupcakes video. Check it out below! This post contains some affiliate links – if you purchase anything using a link on this page, I’ll receive a small commission. I personally use and love everything on this page. Thanks for supporting Life As A Strawberry! If baking cupcakes but not using all the cupcake slots. Will it affect the cupcakes? My oven is always “off” no matter how many oven thermometer’s I use. I’ve tried calibration according to oven instructions, to no avail. Cupcakes always come out to dry or under done….. help!!! Trying to make a cupcake bouquet, when I poked the tooth pick in the back the cake broke off the wrapper. How do I prevent that from happening? Do I need a more dense cupcake and looking for a whipped frosting recipe. For my sons wedding. thank you!!! Why do my cupcakes and muffins stick to the paper liners and How can I keep them from sticking? Iam learning baking in these days please guide me about baking tips.my cake is baked outside but inside its soft what is the reason behind it.taste was ok.
What temperature do I use in a fan assisted oven. I find it depends on both the liners and the recipe! I generally like Wilton cupcake liners (although I’ve been experimenting with some silicone liners to cut down on waste – that might be a great option to avoid the grease factor!) The greasiness of the liners tends to vary with the fat content of my cake, too, so if you aren’t in love with the recipe(s) you’re using it might be worth trying a new recipe to see if it makes a difference! Hope that helps!